I love Tex-mex! When ever we eat out at a restaurant I always order cheese enchiladas with meat sauce; they are my favorite. So, I came up with my own homemade version. My mom always made a cheese enchilada casserole but the meat sauce was not like the one from the restaurants. So I experimented and came up with a meat sauce recipe that is very similar to the Tex-mex restaurants. This is basically my moms cheese enchilada casserole but with my meat sauce. 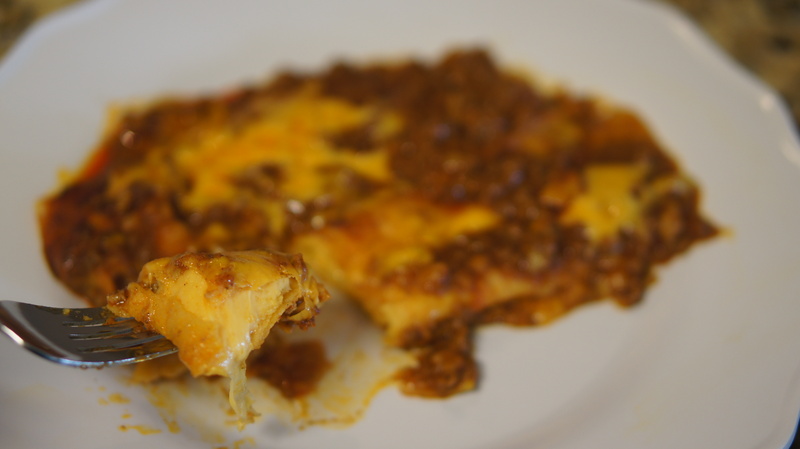 My husband and Tex-mex loving family all agree this recipe is a winner! One thing I really love about my recipe is no need to warm and soften the tortillas in oil before placing them in the baking pan. By lining the bottom of the pan with the meat sauce liquid it softens the tortillas while they bake in the oven. I use gluten free all purpose flour when I cook because that’s how we roll around here. But, the recipe is the same with GF or regular flour. The flour just thickens the sauce. cheese filled corn tortillas covered with a meat sauce. Season beef with minced onions, chili powder, paprika, cumin, garlic powder and salt. Add the tomato sauce and water and bring to a boil. Add flour and mix until completely dissolved. Simmer over low heat for 10 minutes. Spoon the meat sauce (try to get mostly sauce) and line the bottom of your 9x 13 pan. Fill your tortillas with a handful of cheese wrap and place in pan. Pour the meat sauce over the enchiladas and top with the remaining 1/2 cup shredded cheese. Bake for 25 minutes or until the cheese is bubbly and golden brown. This is a very easy dish to make and is so good. I serve mine with Spanish rice and refried beans like a true Tex-mex restaurant plate. Enjoy! YUM! These look soooo good. LOVE mexican fare! Also, can I use your photo on my site? I want to feature your recipe this week! I live in Muskogee, OK and we have a little restaurant that’s been famous since wayyyyyyy back. They make these enchiladas and I’ve never been to another Mexican restaurant that makes them this way. So thanks for the recipe! It was really good! I’m so glad you liked them Amanda! They are a family favorite! This looks awesome. Thanks for sharing. We are gonna try this. This looks and sounds amazing! My niece just found out she needs to be gluten free and I can’t wait to make this for her! Thanks for the recipe! I know you said to use either Cheddar or American cheese, but can you tell me the cheese you use (ie brand & kind)? Thanks! Hello Katy, I use Kroger brand mild cheddar cheese. I buy as a block and shred the cheese with my Kitchen Aid Stand attachment. Best recipe for Cheeses Enchildas! Loved them! Very tasty and super easy prep. My husband loved them and so did my 3 and 5 year olds. Now THAT’S saying something! Brittany, I am so happy your family enjoyed them! Oooh these sound fantastic!! My hubby loves corn tortillas so he will be excited that I include them in a dish!! The meat sauce sounds like it really makes this dish!! Can’t wait to try it! I’ve never had an enchillada, perhaps at Taco Bell. But I would love to try this recipe, and seeing that you really know your enchilladas, it really makes me want to try yours!!! These look sooo tasty! I have had major Mexican food cravings lately! What do you think about substituting flour tortillas for the corn? Just trying to think of what I have on hand…I can’t wait to try these!! This is my go to recipe for cheese enchiladas and my husband always ask for flour tortillas. I make 1/2 corn and 1/2 flour. They’re both very tasty however I find the flour gets a bit more soggy. I made this Chile Con Carne a couple of weeks ago for my husband’s birthday dinner. It was excellent and will definitely be my new “go to” Enchilada sauce. We prefer chili con carne over “red enchilada sauce” any day. Thanks for such a great recipe! Hey Laurie, I’m so glad you liked my recipe! I also prefer chile con carne! I appreciate you leaving a comment! Grew up eating these enchiladas. My dad used to make them all the time. He passed away and never gave us the recipe. Will try this recipe to see if its the same. Thank you. Yay! I’m so happy to find a chile con carne recipe! I do not like the “red enchilada sauce” that comes in a can. Chile con carne is what I always request when I go out to eat. Thank you! Just make these, they are really good. Thanks. Omg thank you soooooo much for sharing this recipe. Its absolutely delicious!!! Made these and they were very good. The downfall is I didn’t want to stop eating them. Looks great! Can you make these ahead of time? Or even just the sauce?